“Mrs Frapwell had just been discharged from hospital after complications with her diabetes. My role was to support her through the transition of leaving hospital and regaining her confidence and independence at home again. As soon as I rang the intercom I knew there was a problem. I couldn’t get to her quick enough; thankfully she was outside her flat but very distressed that she couldn’t stop the toxic smoke from developing. 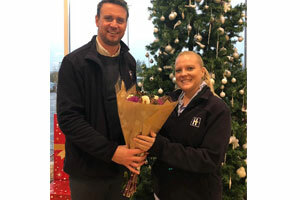 Mrs Frapwell said that she was very happy Lilly was at her home when she was as she didn’t know what would happen stating Hilton Nursing Partners could not have been better and the support she received was fantastic. 100% focused on getting patients out of hospital and recovering in their own homes. Working with the NHS and Social Care Commissioners Hilton Nursing Partners successfully deliver safe, timely and supportive hospital discharges, patient assessments and patient recovery programmes via nurses, therapists and nurse led personal nursing assistants with a proven track record in freeing hospital beds, as well as reducing re-admissions and on-going social services support.